I continue to make excellent speed and am in high spirits. A fine day for river travel, except for the 20 mph headwind I encountered several times. It does not seem to be accompanied by the white caps, as it was north of St. Louis, and for that I am supremely grateful! Such a wind is now an irritant, but no longer an impediment to my progress. Observed more geese today, heading north, and also I detect the faint tinge of yellow to some of the trees on the bank, reminding me that autumn is nigh. I am camped in the most satisfying position of the entire journey, I believe. A soft expanse of packed sand, shaded by many leaning trees. The sun is setting across the river; it’s about 75 degrees, and just a hint of cooling breeze. Very peaceful, no mosquitoes! 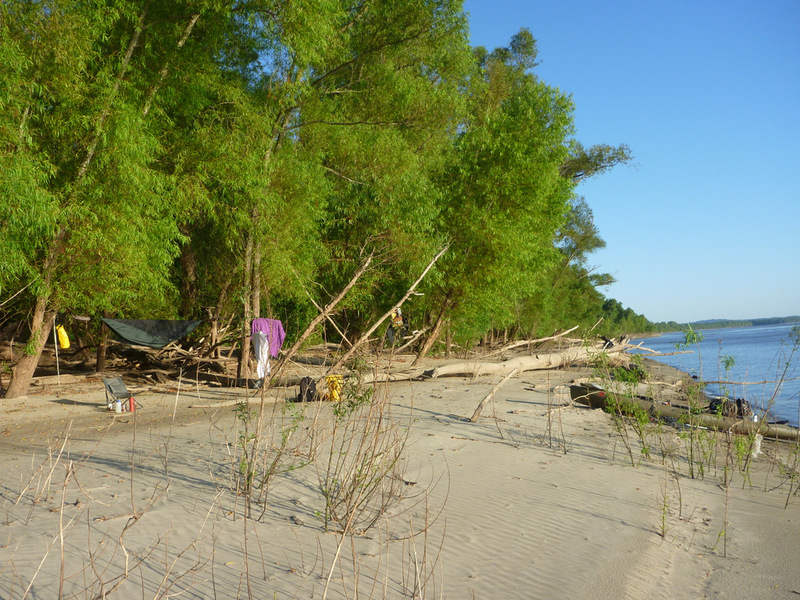 It would seem, for reasons unknown, that the east bank is rich in such attractive sandy shores, while the west bank tends to offer four-foot-deep mud.